Alitalia GSA of Baldo and Sara Baldi. The hand-woven Kente cloth (Kete in the Ewe language) is not just any kind of fabric that we use to cover ourselves. 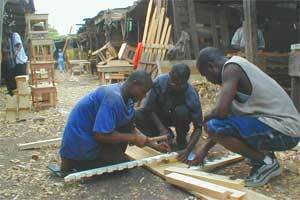 Kente weaving is a genuine form of popular art, rich in traditions and also in new inventions. 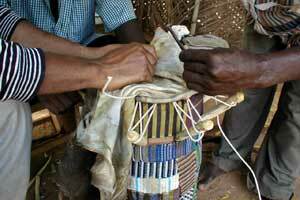 Hand-weaving is effectively one of the vital organs of the Ewe culture. - analysis of the traditional fabrics, research into their symbolic universe, into the operating techniques and rituals. - works created together with the local weavers, experiments with new forms and new fibres. - cultural and didactic initiatives in Italy and Germany, publications in print and on the Web. The urgent objective of this complex of initiatives is social development. Because a greater appreciation of Kente cloth must also lead to an improvement in the precarious condition of the artisans who create it: the village weavers. 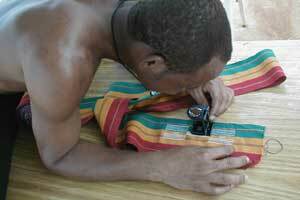 In 2003 Unesco has declared Kente weaving to be a "living cultural heritage of humanity". In the cultural fabric of the Ewe the loom is intimately linked to music and dance. These three arts are traditionally learnt and practised by everyone. And so, Hand-in-hand Weaving opens with a Textile Performance by the weavers of the village of Klikor, along with their families and children. They bring along their best cloths and instruments, both textile and musical. To the accompaniment of a sacred weaving song, they weave and dance before their traditional kings, before the diplomatic representatives and a delegation from the Italian government. 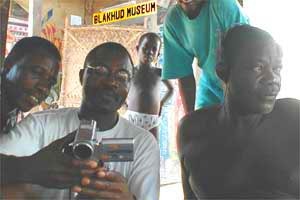 Meanwhile, in the village of Klikor, a child is born, who will be called Exhibition in memory of the event. There are still many skilled weavers in the Ewe villages. The trouble is that, in the majority of cases, they are forced to work on second-rate articles because they don't have the money to pay down for good quality yarns with the right dyes. And so their expertise is devoted to the weaving of ephemeral articles: souvenir fabrics for some important ceremony...but the colours of which will run with the first drop of rain! This is the cloth normally demanded by the Market; it is called "Asivo": market cloth. But if "Asivo" is the rule, there also exists the exception: "Afevo", which means "home cloth", this is precious fabric, designed to wear and worthy to be included among the family heirlooms. A family's respectability is linked to its economic and cultural possessions: genealogy, lore, glass beads and fabrics. Afevo is also the name of a collection of cloth samples which the weavers of Klikor donate to their village museum: the Bakhud Museum. Finally "Afevo" is also the name of a website and CD-Rom where each sample, multiplied on the computer screen, becomes a stage on a kaleidoscopic journey through a hundred original chromatic modules. This is the most extensive document on Kente available on the Internet. There is also an annotated catalogue of the pieces, featuring images and texts illustrating all the phases of the weaving within its environmental and cultural context. In order to develop a market abroad, the art of African weaving cannot be restricted to the offer of nyonuvo and nutsuvo the classic male and female cloths. The form of these traditional articles is difficult to adapt to new functions. Instead, an immediate example of a new format is Bedspread B1, designed by adapting the compositional symbols and structures of the traditional cloth to the normal dimensions of a bedspread for a double bed. Hemp is an ecological fibre of excellent qualities. The weaving of precious articles in hemp yarn is a perfect way to reach new markets. >>> HempStrag is a bag made using the traditional model of the single strip (abadakà). The woven strip is folded in line with its sub-sections (atijija) and is then sewn together with three straight seams. >>> Icon Table-mats for the dining-table. Each item is brocaded with a different icon, always designed in the traditional form of the strip. The "legend scarf" is possibly the most successful gadget ever created using Kente cloth. These are normally decorated with legends such as "Greetings from Ghana" or the names of colleges or companies and various commemorative phrases. These cheap scarves are made of Asivo: low-quality market fabrics. But they can be valorised. >>> Pearls of Wisdom in Klikor is a "woven anthology" of the numerous mottoes and sayings which decorate walls and vehicles in the village of Klikor (in Ghana, you are greeted by a proverb at every corner). As well as the concepts of the individual messages, precious here are both the lettering and the composition of the plain-weave ground, referring back to the Afevo tradition. B1, HempStrag,Icon Table-mat: Luciano Ghersi & Mensah Kpodoh. Documentary panels on: the exhibition and workshop at the Artemision Fiber Art Festival (Görlitz) with the participation of the weaver Mensah Kpodoh; course at the Fondazione Arte della Seta Lisio; performance and workshop at Ex Tempore, International Fine Arts Academies Symposium etc. the essays and articles published in Textile Forum, Jacquard, tessereAmano, www.hypertextile.net . A few Italian experiments in Kente weaving. Luciano Ghersi: Magnetic Kente. Weaving of waste materials with inserts in magnetic rubber, can be draped at will on metal panels. Eva Basile: My Kpevi. Three-dimensional variations on the double warp or Kpevi, a traditional technique of Ewe weaving . Tessere Liberi, Self-run African Weaving Workshop: Sample Banner made of fragments of cloth woven by the pupils. Thanks to this exhibition too, hand-in-hand weaving continues, with new hands and with new weaves! The Prato Textile Museum has offered its new premises for the next edition of the exhibition in 2004.